Finally it is summer. Well, sort of summer, the weather in Chicago cannot make up its mind, and I have yet to spend any time in a pool, which always seems the true harbinger of summer to me. But I am delighted to report that the official kick-off of summer cooking has hit me. Gone (mostly) are my cravings for macaroni and cheese and roasted root vegetables and braised meats, and arrived is compelling desire for fresh veggies and fruits and lighter fare. Cherries, a favorite fruit, have begun to come in, as has watermelon. Asparagus is everywhere. And zucchini and other soft squashes are tender off the vine and utterly without the tough bitterness of the versions you get in the colder months. Sometimes, though, we just want a simple dish, no courses, minimal fussing, no coals. Dinner you can eat in one bowl with one utensil, preferably over your lap on the couch watching something mindless and fun. When I was doing my intensive health program last Fall and Winter, this dish saved me. I made it at least two to three times a week. Since I will never give up carbs, especially pasta, it helped me get my fix without derailing my program. It is pretty simple, just pasta and chicken and zucchini in a light lemony sauce. But because there are equal amounts of pasta and zucchini cut into pasta-like strands, you get all the pleasure of twirling up large forkfuls with half the carbs. Plus, and this is really always the most important part, it is really freaking delectable! It is a recipe I developed while working on GOOD ENOUGH TO EAT , the kind of dish the chef-heroine would be serving up at her healthy gourmet café. Whole grain or multi grain pastas work great here, as does Quinoa pasta for the gluten-free people. I use chicken breasts for maximum lightness, but boneless skinless thighs are great in this for deeper flavor, as is veal. I made it a couple of weeks ago for the first time for Charming Suitor who did a massive euphoric eye roll and said “I just wanna stick my face in it and blow bubbles.” Which is pretty high praise for something that is actually good for you! When it come to prepping the zucchini, you can certainly do it by hand, but I am less patient, so I love the Swissmar Julienne Peeler . I got mine in a set of three, with a regular and a serrated peeler as well. They are sharp as the dickens, the Y shape is very comfortable and easy to use, and they go right in the dishwasher. For this dish it makes the zucchini "noodles" perfectly and in seconds. They are very affordable, so I'm planning on getting another set for Charming Suitor's house! What are your go-to healthy dishes that don’t feel like deprivation? Share with the class! And because I am true and blue to my wonderful hometown…GO HAWKS!!!! Heat oil in a large skillet over medium-high heat until hot. Add the shallot, and cook till translucent. Add chicken and sauté briefly until light brown. Deglaze the pan with the wine and let reduce till almost gone. Add chicken stock, lemon juice and lemon zest. Swirl in butter. Taste for salt and pepper. 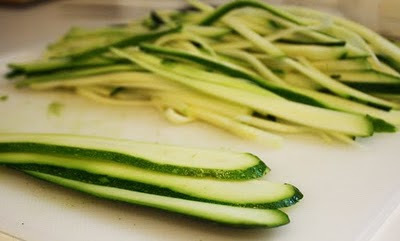 Toss in zucchini strands and then immediately add cooked pasta and combine. Add the cheese and herbs and enough reserved pasta water to ensure the sauce is smooth, and toss to combine well. Taste again for seasoning and add salt and pepper, as needed. Grate about 2 more tablespoons Parmesan over the top and serve at once. Thanks for this recipe - I made it for dinner tonight and oh my goodness is it yummy! My husband, who does not like vegetables, also loved it!